1. The Bones material is touted as being ready to paint, and on the forums at reapermini.com people are stating that they sometimes need to be washed first for the paint to stick. 2. 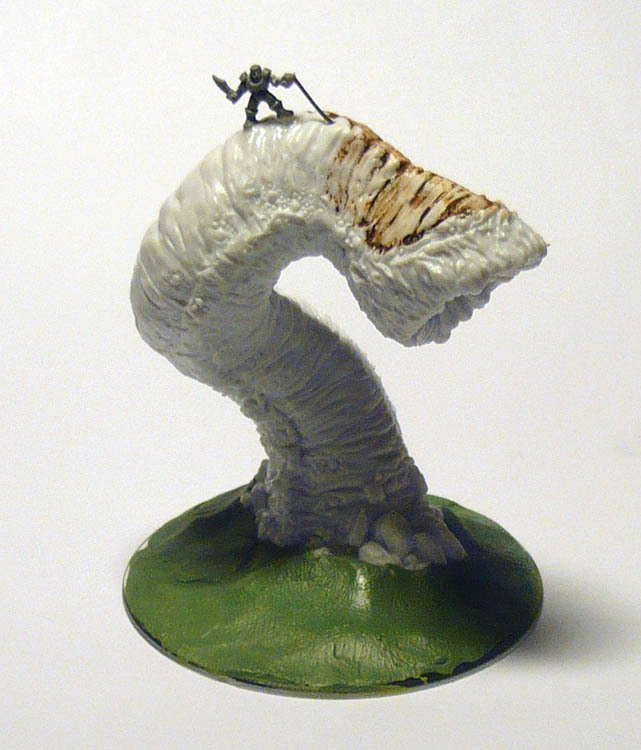 Army painter paints do not stick to the worm, even after washing. So I will need to spray it. Which is a problem seeing as it currently is about as cold as in my deep freezer outside, and I do not have any place indoors where I can use a spraycan. I will try an old brush-on primer I have lying about. You can see where I tried a bit of brown, and had to wipe it off as the plastic rejected the paint. 3. Base: a simple 60mm old akrylic flying base with some green stuff on. This is the first layer. I will be trying for a sand-dune look without the rocks that are around the bottom of the figure. I will either carve them off the figure or build the sand higher. Or both.